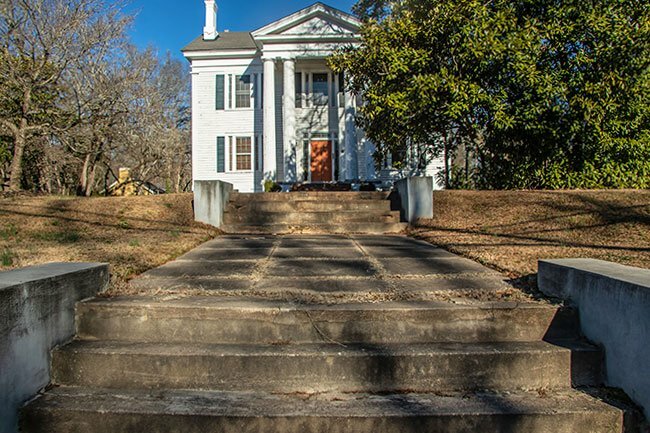 This Greek Revival home in Laurens once belonged to a South Carolina governor and Chief Justice of the South Carolina Supreme Court. Designed by its original owner, Christopher Garlington, in 1839, the manse boasts five chimneys and two pairs of fluted Doric columns. Towards the end of the Civil War the home was purchased by William Dunlap Simpson, a graduate from South Carolina College (now the University of South Carolina) who also attended Harvard Law School. Prior to the war, Simpson had established himself as a prominent servant of the state. He was elected to the South Carolina House of Representatives from 1854 until 1856 and again from 1858 until 1860. Simpson continued his public service during the war, sitting in the South Carolina Senate from 1860 until 1863 and in the Confederate House of Representatives from 1863 through 1865. He was able to serve in the Confederate army as well, rising to the rank of Lieutenant Colonel. After the war Simpson was elected to the United State House of Representatives, yet he was not confirmed due to his active past in the Confederacy. His political career continued to soar, however, and he was elected lieutenant governor in 1877 with Governor Wade Hampton, where he served until Hampton resigned for a seat in the United States Senate in 1879. Simpson then became governor for one year before being appointed Chief Justice of the South Carolina Supreme Court until 1890. The house remained in the Simpson family until 1939. 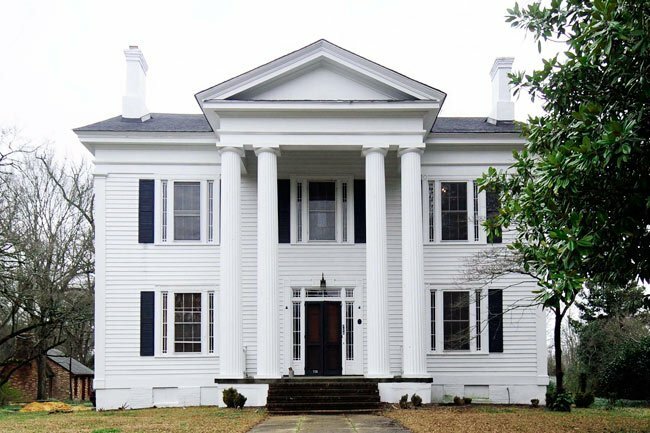 Constructed in 1839, this Greek Revival dwelling has been owned by South Carolinians of prominence in both local and statewide affairs. The Simpson House is an excellent example of Greek Revival architecture. Its designer-owner, Christopher Garlington, probably with the aid of a pattern book, created a structure that still retains the aura of an antebellum plantation house owned by a wealthy planter. The white clapboard structure has three stories with a total of twelve rooms. The gable roof is pierced by four end chimneys contained within the structure. A fifth chimney is in the rear projection. At the end of the Civil War William Dunlap Simpson purchased the house from John Adam Eichelberger, a wealthy planter who had used the structure as his townhouse. Simpson, a graduate of South Carolina College and Harvard Law School, had been a member of the South Carolina House of Representatives for several terms and was a member of the State Senate when South Carolina seceded. During the Civil War, he reached the rank of Lieutenant Colonel. After the war he was elected to the US House of Representatives; however, due to his Confederate affiliations, he was refused his seat in the House. Wade Hampton was elected governor in 1876 with Simpson as lieutenant governor. When Hampton was elected to the US Senate in 1879, Simpson became governor. He was appointed Chief Justice of the South Carolina Supreme Court in 1880. The Motes family purchased it from Simpson heirs in 1939. The once elaborate gardens, orchard, and vineyard have disappeared. The Motes family got it because Mrs. Louise Motes was Gov. Simpson’s granddaughter!